Kyle is dreading his first trip aboard the school bus. Luckily, his big brother, James, is a school bus expert. 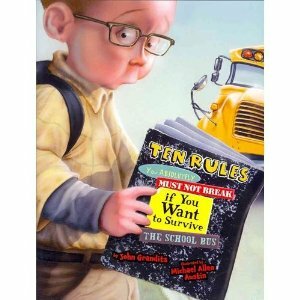 James gives Kyle ten rules for riding the bus that he absolutely, positively must obey if he wants to avoid getting laughed at or yelled at, pushed around, or even pounded. During his fateful ride, Kyle grapples with each essential rule. Along the way, he discovers that the school bus isn’t so bad—and he may even have a thing or two to each his brother.